Want to Own Your Own Pizza Restaurant? You’re passionate, you’re motivated, you’ve set your goals, and you’re ready to go. You’ve done your research and you know that the quick service restaurant (QSR) industry, which includes the fast food segment, is expected to grow at a rate of 2.5% for the next several years. Now you just need to decide what type of restaurant you want to own. 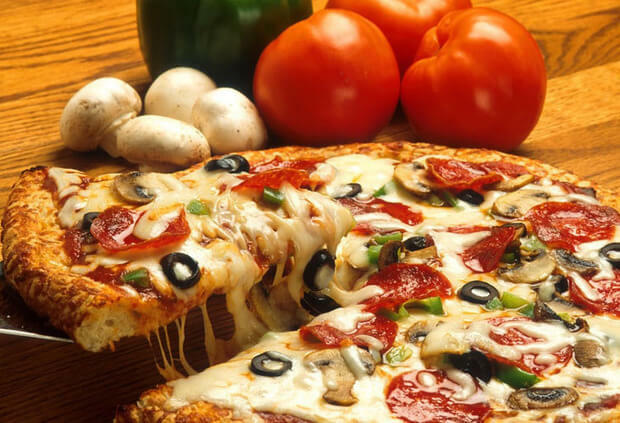 Pizza, one of the most popular fast foods, can be modified to suit numerous tastes and has become a staple for many take-out, delivery, fast food, or fast casual businesses. In fact, pizza parlors make up 15% of the QSR market. However, it is crucial that any entrepreneur knows that the majority of new businesses fail in their first year, because they lack a business plan and management skills. This is where buying a pizza franchise, such as Hungry Howie's, can give you an advantage. Researching your local market is just as or even more important as learning about overall industry trends. Make sure you know the ins and outs of the local economy and the needs of the community. Is your community particularly health conscious? What types of restaurants are lacking in your community? What other types of restaurants are nearby? You may do better in an area with just a few pizza restaurants than in an area with one on every corner. More than half of the pizzerias in the US are small chains or independently owned. If you decide to stay independent, you will have complete control over your brand and your business, which is something you may prefer. However, a franchise comes with built-in brand awareness and has already solved many of the problems that a new restaurant will run into. Whether you choose to invest in a franchise or go out on your own, overestimate the amount of capital you will need. It is common for new restaurant owners to underestimate how much it will cost to open their restaurant. The general rule of thumb is to add 15-25% to your startup budget in order to cover unforeseen expenses in the crucial first year of operation. Choosing a franchise will give you an idea of what to expect, however, you should still use the 15-25% rule to cover unexpected costs. Many people like the convenience of placing a phone call or ordering online and having a hot pizza ready for pick up or delivered to their door. With more than one billion pizzas delivered each year in the US, including a delivery or take-out option in your business plan will ensure that you are not losing customers that don’t want to cook but also don’t want to eat out at a restaurant. If a restaurant’s menu is too limited, it won’t likely survive. Most pizza restaurants offer calzones or subs, pastas, and other Italian favorites for those who want something other than pizza. In addition, salads, wings, and garlic bread, as well as brownies or cookies are popular as add-ons to the meal. Flour and cheese are the main ingredients utilized in a pizza restaurant. However, the prices on these basic ingredients can fluctuate wildly on a day-to-day basis, which will also affect your bottom line. To control your costs, you may want to contract with a food supplier to lock your prices for flour, cheese, and other commodities so you are not at the mercy of the caprices of the stock market. Some of the top franchises, such as Hungry Howie’s, are able to contract for even better prices due to volume. They also have distribution centers that service some of their stores. Franchisees must purchase all food products at these distribution centers, but they are made available at a favorable price. This gives you the advantage of knowing that the price of your raw materials will remain relatively stable. Keeping an eye on your portions is key to reducing waste, supplying a uniform product, and keeping your food cost in line. Measure your dough ingredients with a food scale, use measuring cups for cheese and other toppings, and a flat ladle for putting sauce on the pizza – these steps will ensure that you don’t lose money, or create an inconsistent product, by putting too many or two few toppings on a pizza. Offer catering. If you have a delivery option at your pizzeria, then implementing catering should be easy. Offices, schools, or any gathering that requires food for large groups of people can easily be catered by a pizzeria and can help grow the business. For many large parties, you can plan for two or three slices per person. You can also include some of your other menu items in larger sizes at lower prices. All restaurants must carry insurance against the loss of their business, workers’ compensation, and basic liability insurance. If you supply delivery services, you will need additional liability insurance to cover drivers when they are driving on the clock. Starting any new business involves a lot of planning and hard work. New restaurants face especially tough challenges, since new restaurant concepts can take some time to catch on. By choosing a pizza franchise, you already have proof of concept and have a good chance of succeeding where many others fail.